Bits of Sweetness: Oh we like ice cream! Oh we like ice cream! We had a great time at the northwest washington fair. 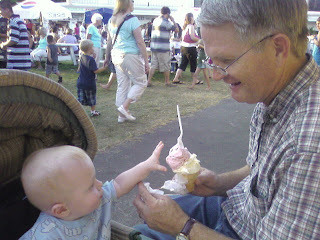 Grandpa came with us and shared some ice cream with andrew. We had a fun time there and andrew loved all the sights. He even got to pet a baby goat! Oh, did i mention that he learned to CRAWL this weekend?! It is such a joy to watch him grow and learn.